In the lead up to the Second World War, the small town of Bardia, which lies approximately 30km from the Egyptian border on Libya's Mediterranean coast, was fortified by the Italians, who constructed an arc of defensive posts, 29km in length, surrounding the town and its harbour. Officially entering the war on 10 June 1940, Italian forces under General Annibale Bergonzoli crossed the Egyptian border in September and captured Sidi Barrani situated on the Mediterranean coast 80km inside Egypt. 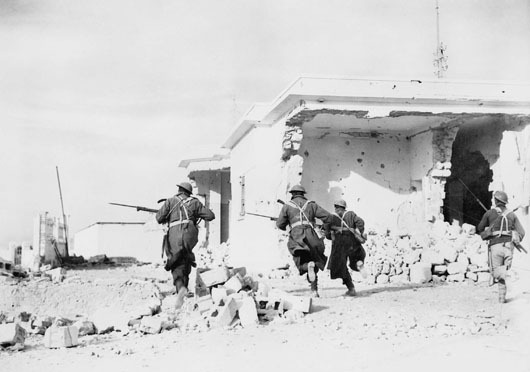 Outnumbered British and Indian forces on 9 December 1940 destroyed four Italian divisions, captured 38,000 prisoners of war and chased the Italians out of Egypt and back to Bardia. The first brigade of the newly formed 6th Australian Division arrived in Egypt in February 1940, After training in Egypt, the Australians crossed into Libya on 19 December to take their place in the front line. On the morning of 3 January 1941, the men of the 16th Brigade of the 6th Australian Division attacked Bardia, breaking through the western face of the defensive perimeter, while soldiers of the 2/6th Battalion launched a diversionary attack on the southern side. 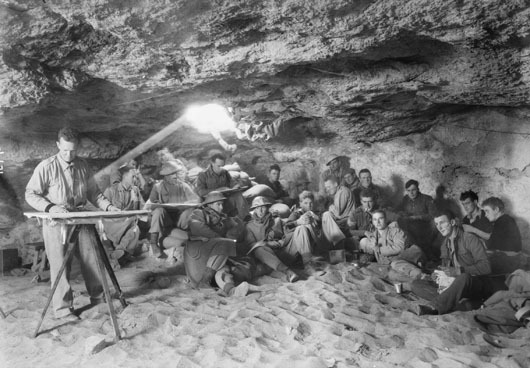 Later in the morning, the 17th Australian Brigade joined in the attack. On 4 January, the 16th Brigade encircled Bardia and during the afternoon Australian soldiers entered the town. Little Italian resistance remained in the northern sector but fighting continued in the southern sector until the following day. On 5 January, the following bulletin was issued by General Headquarters in Cairo: “All resistance at Bardia ceased at 1330 hrs today”. 130 Australians had been killed in the action, and 326 were wounded. However, they had taken over 40,000 prisoners, 400 guns and 127 tanks. For some of the Australian soldiers, at least, it seemed that the early success at Bardia went to their heads. One Australian apparently had to be reprimanded by Major-General Iven Mackay for galloping through Bardia on a white horse, dressed as an Italian admiral and waving a sword. Others earned the ire of Mackay by dressing in Italian uniforms, firing enemy weapons. However, Gavin Long in the Official History was more tolerant and understanding. He also wrote that the decisive work at Bardia was the ingenious and resolute foot soldiers and not the tanks or artillery as some writers have claimed. 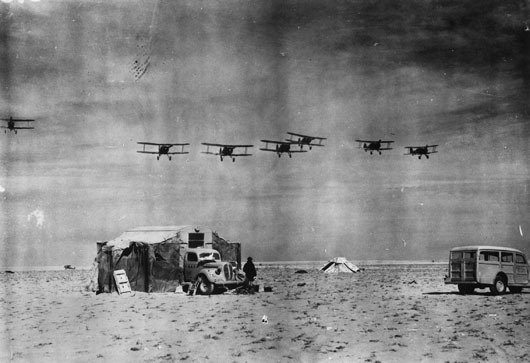 Although Bardia would change hands between the Allied and Axis forces throughout the Western Desert Campaign, it was eventually abandoned without a fight following the Axis defeat at El Alamein in November 1942. Maj. Peters, O.C., discussing plans with gun crews and officers before the attack on Bardia (AWM 004951). 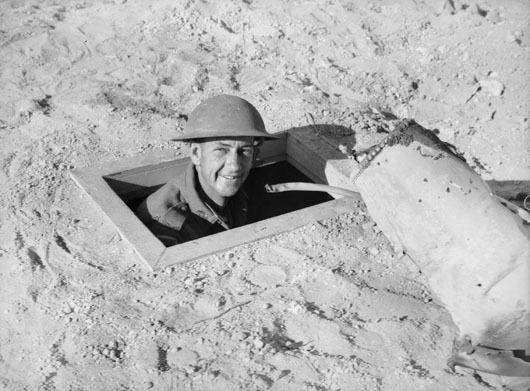 Foxholes dug in the desert often provided the only cover from enemy air raids and artillery barrages (AWM 004952). 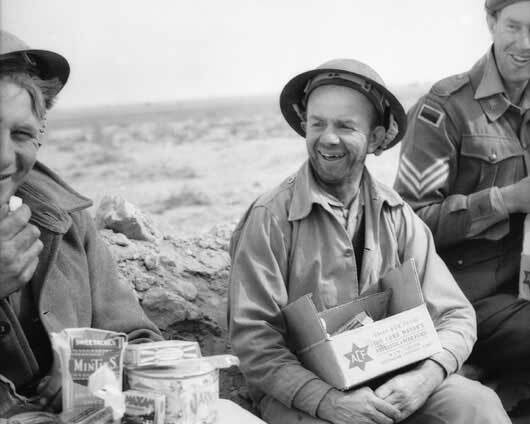 Men of the 2/2nd Battalion holding comforts funds issued on Christmas Day, camped between Sollum and Bardia (AWM 004953). 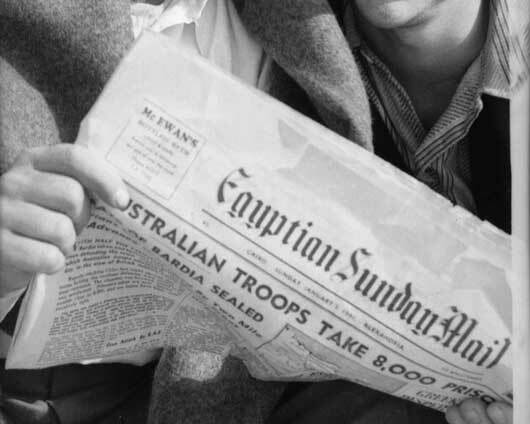 The morning after the battle, Australian soldiers read of their deeds in the local Egyptian papers (AWM 005217). Troops rushing through the streets of ruined Bardia in search of any stray enemy soldiers (AWM 006083). Gloster Gladiator aircraft of 3 Squadron RAAF returning to land after a patrol over Bardia, before the battle (AWM 042275). 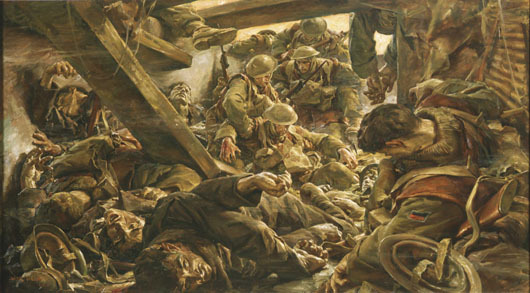 Ivor Hele, "Bardia (action leading to the fall of Post 11)" (AWM ART27576).